I have spent this week trying to get that one memorable photo of a Hummingbird before they leave for the winter. The birds have been extremely active this week. It might be because they are getting ready to move south, but I don’t know that. 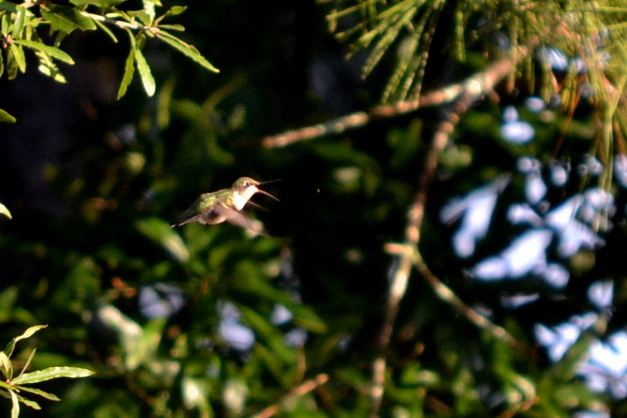 I have casually watched these Hummers out the kitchen window for years. The feeder, the Butterfly bush and then the trees. This has been their pattern year after year. The two photos I posted the other day were from the Butterfly bush, but this one is from the trees. I know my photos are not very good in photographic terms, but I really want to share this one, good or bad. I probably coud take another thousand photos and never get this shot again. Of course when I took the photo I had no idea what I was getting. This entry was posted in Birds and tagged Bird, Bird feeder, Birding, Butterfly Bush, Hummingbird, Photograph, South Carolina by Mud. Bookmark the permalink.